How do we assess art? This is a common and difficult situation for every person concerned about art education, whether they are educationists, curriculum designers, or practicing teachers. The art teacher is a ‘constant’ between the art work and the student in an art class where he/she has full autonomy and is accountable for his/her actions and assessment of students. The assessments carry messages for what count as ‘good’ or ‘desirable’ outcome, an evidence of progression, a certain acknowledgment of quality of skill and competency in comprehending art concepts. Hence, the marks, grades, or annotations on artworks of students play a deep, standing effect in the context of classroom learning. To understand and make sense of such dynamics, I had, as part of my M.Phil. 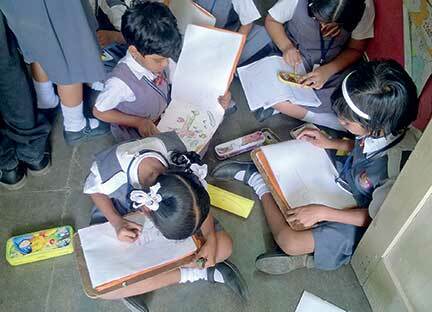 Research, studied teacher practices of visual arts and design in middle schools in Hyderabad. Some of the interesting ideas concerning assessment that emerged in teachers’ discourses have been discussed here. To share and mention the crux of assessing, I had an experience with a pupil of class two. It was a regular art class scheduled in the afternoon. All of them were excited, though I saw a few enthusiasts and a few pupils lost in their own world. At the start of the class, the art teacher made a small drawing on the white board with a marker. 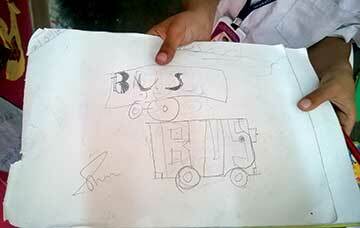 The drawing was a representation of ‘BUS’ form, juxtaposed with English lettering within the form. The children were instructed to copy the same on to their drawing books or sheets; and later colour according to their choice, within the outlines. As a usual practice, everyone drew half an inch border on the paper, a few pupils used rulers while others didn’t. One enthusiastic student, who was in a hurry to act according to instructions took the pencil and finished the drawing in three to four minutes free-hand, and was in front of the art teacher with his drawing. The teacher asked, “What is this? – Wrong – see properly on the board – give here (teacher took the book)”. The student silently bowed down, disappointed, and looked at the researcher while handing over his book to the teacher. The teacher took the student’s drawing and drew a new one beside it and put his signature; the teacher said, “Ok, Now go and sit, don’t talk.” I, as a researcher, could not utter a word, being a silent spectator. The student took his book, went back to his place and closed the book calmly, only to begin chatting with his friend. Later, in an informal talk the teacher clarified that it was just a 20-minute class where he was required to engage the students with something relatively ‘easy’ for their ability. Now, I would like to reflect, pertinent to this situation. Did the teacher assess his own drawing with that of the students’ ability to copy? Some more questions could be, how and where do we conduct an art class? What kind of concepts are we supposed to address and at what age level? How and where are we addressing the students’ concerns? In a school situation, the art teacher is considered to be the most knowledgeable (in arts) among the school community on deciding and describing good art and bad art. This has been noticed during interactions with art teachers and classroom observations during the study. The art teachers expressed that art has been relegated in comparison with other subjects in the school curricula in terms of regular practice and assessing the gradual development. There are other factors disregarding the position of art as a subject in today’s schools, like scheduling art class in timetables, approaches adopted towards the subject itself (i.e., as a hobby, a leisure activity, and relaxing time, etc. 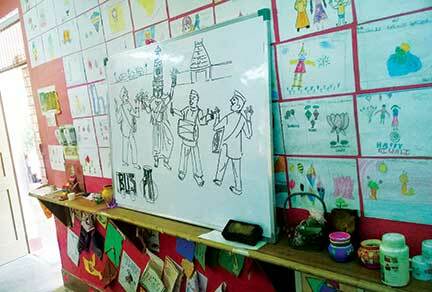 ), using art classes to cover the syllabi of other subjects and encouraging students for art competitions alone; in and outside the schools for the sake of laurels. In spite of all these concerns, art teachers “grade” the students in their subject as per school authority. Mostly ‘A’ or ‘B’ is the grade given. The criteria that teachers adopted to assess art works, has hardly reflected the tasks/objectives they wanted to achieve during the art classes. What the students were assessed on were ‘neatness’ maintained, handling of the colours (within the outlines), and exactness of ‘copy’ from the teacher’s drawings. Sometimes, the assessment is based on the ability to follow the teacher’s instructions in detail during the art classes. For any observer, all these would raise questions about developing pupils’ capabilities and understanding of art as expression, art as a communicating medium and art as a cognitive tool. During the study, I observed that the teachers were trying to develop their own understanding about the subject in most situations. In response to a question, “How do you assess your student’s understanding of the subject?”, a teacher’s said “…..I just give the grade ‘A’ to all of them, they enjoy the art class. I understand their work first.” When probed further, “Is there any criteria to it?” The teacher replied, “What criteria? I know them, they do good work, and you know, anything is art in this world, picchigeetalu geesina adhi ArtE, eeerojulloo! (Doodling and scribbling are also considered art in today’s world). Some more questions were asked to know how the teacher grades each pupil and what the teacher attempts to see in the art-works. The teacher talked about techniques and a systematic following of instructions. The following ideas around assessing art practice mentioned by the teacher brought out this aspect. First, how the student does the colouring “within the outline”. Second, the neatness in the art-works to pass the ‘judgment’. Another teacher who valued students’ work as a means of expression had a different take on assessing a student’s artwork. The teacher said, “Let the students enjoy the art making… personally, I don’t feel like giving marks to their art work, their experience is more important to me, they enjoy the half an hour they get in a week.” While a third teacher’s response was a little different from the two discussed earlier. Perhaps, the difference emanates from his thinking and art practice itself. He personally felt that art cannot be assessed. But in practice he does assess the student’s periodic progress with comments on art work in the yearly review reports. In these review reports, a student’s approach and understanding are captured with subtle details of their engagement during the art class, their patience in handling the medium, their developing metacognitive skills, etc. This showed that the teachers’ self-understanding of assessing art influenced their approach and appreciation of the students’ works. Hence, it is important that their epistemology about art and its role in education is broadened to help them look into their own practices consciously. Assessing art does not mean ‘judging’ what is right and wrong or ‘judgment of other’s feelings’. It is a set of criteria which enables one to reflect on how many of the goals set have been achieved from the task and the art class. How much do students understand, engage in different exposition of art forms and modes, how they negotiate with new concepts, skills and values in relevance to their life experiences and applications. What seems interesting is also that an understanding of assessment in art education is fundamentally tied to practice. An art teacher needs to have an exposition to ideas and freedom to practice pragmatic ideas, experiment with students in trying out art concepts and skills by tuning them to their interests and then be able to discuss the outcomes with peers. Perhaps, organizing such communities of art practitioners and exchange of ideas would help build a more contextual and robust understanding of how we can practice assessment in art classes. Also, this will help address the spirit of the idea that comes from a common question raised by teachers, “How can we judge art?” which can be turned into “How do we assess art” and rethink art practices! The author is pursuing his PhD at Tata Institute of Social Sciences, Hyderabad. He is also an art practitioner with varied interests in art and education. He can be reached at shravankumarpendyala@gmail.com.